I put the Canon 24-70 2.8L II on the 1Dx and the Fuji 16-55 2.8 on the X-Pro 2 and played around with both cameras trying to shoot various things. Now, I’m going to keep this simple. Yes the 1Dx wins (whodathunkit?) but… most of the time the difference was only about 1/4 to 1/2 second at most. The 1Dx (mostly) just snapped on target with the main delay being the time it took to move the elements (not long). In contrast, the X-Pro 2 took a quarter to half second to grab focus (sometimes less than 1/4 second). It also sometimes does a quick pump (to check focus?) before locking on. The Canon sometimes took a while to focus too if I was going from the furthest distance (infinity) to the closest distance. However, that’s because it was moving all those big elements. In this case sometimes the fuji was actually faster. But, usually you don’t shoot that way. Accuracy was very good on both cameras. I have both set to prioritise focus over shutter release, so with the both I could hold down the shutter button and let it fire as soon as it grabbed focus. As said above the Canon nailed it quickly and accurately, the Fuji had a little delay. Which brings me to my next point. However, when I checked the image it was in perfect focus. Just a little quirk with the X-Pro 2 to be wary of. I’m not sure if this is a problem inherent with electronic viewfinders though. So overall. 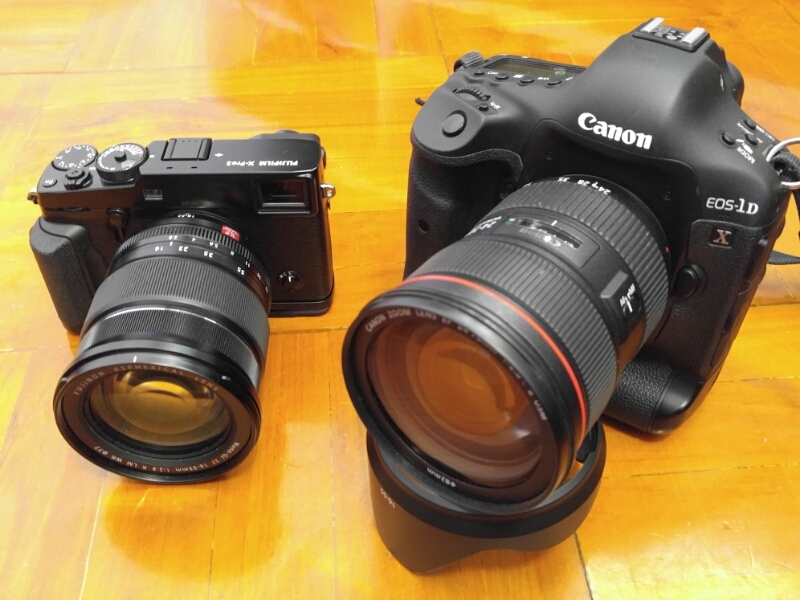 Yes, of course the Canon is faster but will the X-Pro 2 be fast enough for you and for me. Well I think mostly and for most people the Fuji is fast enough. Unless of course, your style of photography requires that 1/4 second advantage the Canon offers of course. I think Fuji should endeavour the improve the AF though as from what I’ve read online, the Fuji still lags behind similar cameras. Fuji have a Kaizen (always improving) philosophy and are therefore very good at improving their cameras with firmware updates. I look forward to Fuji making the AF faster. Accuracy is spot on, but if they can make it so it locks on quickly without doing a small “pump” before focusing, that would be great. Also while you’re at it Fuji, add 4K video and improve the video features overall.